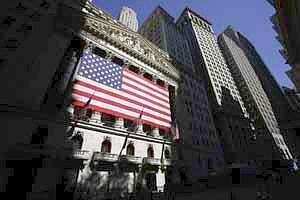 New York: US stocks surged on Wednesday after major central banks agreed to make cheaper dollar loans for struggling European banks to prevent the euro-zone debt woes from turning into a full-blown credit crisis. The Dow posted its best day since March 2009 after the Federal Reserve, the European Central Bank and other major central banks stepped in to head off escalating funding pressures that threaten the key arteries of the world’s financial system. The S&P 500 scored its best daily percentage gain since August. The central banks´ liquidity move touched off a buying frenzy in financial shares. The S&P financial sector index gained 6.6%, with Bank of America the most actively traded stock. The stock jumped 7.3% to $5.44 on more than 420 million shares traded. The drama in Europe kept the US stock market on a roller-coaster ride throughout the month. For November, the S&P ended down just 0.5%, but the month was marked by sharp daily swings. “Markets will reward you for the efforts you are making as long as you are moving in the right direction. It’s the carrot and the stick; you get rewarded when you do the right thing, and you get punished when you do the wrong thing." The Dow Jones industrial average shot up 490.05 points, or 4.24%, to end at 12,045.68. The Standard & Poor’s 500 Index jumped 51.77 points, or 4.33%, to 1,246.96. The Nasdaq Composite Index soared 104.83 points, or 4.17%, to close at 2,620.34. The Dow scored its largest daily gain -- in terms of points and%age -- since March 23, 2009. The S&P 500 posted its best daily%age advance since 11 August. For the month, the Dow gained 0.8%, while the Nasdaq slid 2.4%. Other economically sensitive sectors, including energy, materials and industrials, also were strong performers for the day. Copper and oil futures rose sharply, while the S&P materials sector index jumped 5.9%. The central banks’ actions were intended to ensure that European banks, facing a credit crunch, have enough funding amid the euro zone’s worsening sovereign debt crisis. The moves followed an unexpected cut in bank reserve requirements in China, intended to boost an economy running at its weakest pace since 2009. Among the banks, shares of JPMorgan Chase & Co gained 8.4% to $30.97, its biggest daily%age gain since May 2009. The gains in financial shares came despite Standard & Poor’s move to cut the credit ratings of 15 big banks, mostly in Europe and the United States, late on Tuesday. Further encouraging investors, the latest US data suggested the US economy was moving more solidly toward recovery. The US private sector added the most jobs in nearly a year in November, while business activity in the US. Midwest grew faster than expected in November. The day’s volume was high, with nearly 10 billion shares changing hands during the day on US exchanges compared with the daily average of 7.96 billion shares. Advancers beat decliners on the NYSE by nearly 7 to 1 and on the Nasdaq, by about 5 to 1.